Another blow for Christian minorities in the Middle East: last week, Turkey’s highest court ruled against the Mor Gabriel Syriac Orthodox monastery (left), the oldest functioning Christian monastery in the world, in a long-running lawsuit brought by local villagers. 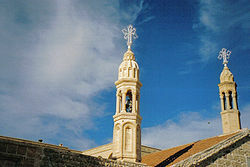 The lawsuit accused the monastery of “anti-Turkish activities,” including the illegal occupation of land that allegedly belongs to the government. Most commentators have dismissed the merits of the lawsuit — among other things, the suit claims the monastery occupies the site of a pre-existing mosque, even though the monastery predates Islam by centuries — and the high court’s behavior during the litigation has not reassured people. At one point, for example, the court apparently “lost” the documents the monastery submitted in support of its claim. The monastery will now appeal to the European Court of Human Rights, which ruled against Turkey in a similar case involving the Greek Orthodox a while ago. The EU, meanwhile, has expressed “serious concern” about the decision. « How Important is Public Support for Religious Freedom? While I don’t believe the decision passes the laugh test, it certainly raises difficult questions about the role that theology plays in any legal system. Islamic theology teaches that Islam is the natural religion, and in that sense can pre-date anything. Simply pointing to “historical truth” or “science” not only isn’t going to convince anyone, but is a complete non-sequitur. Closely following the plight of the Greek Orthodox community in Turkey, I am astounded with the Turkish paradox with respect to religious affairs. On the one hand, there is the constitutionally enshrined principle of secularism (the strictness of which is usually promoted as a rather essential element of Turkish national identity following the disintegration of the Ottoman Empire). On the other hand, various levels of the Turkish State exercise all kinds of direct and indirect controls over religious communities. Such controls have been widely documented and include interference in the selection of religious leaders, asphyxiating regulation on charitable activities of minorities through the hyper complex regime on foundations, and the recurring denial of property rights and the legal status of minority groups. The question is how can one explain this defensive reflex on the part of the Turkish State when dealing with minority groups? When we tend to approach this question from our own social or constitutional perspectives, we miss (I think) a very important point which characterizes the modern Turkish psyche. In Turkey, the practice of identifying collective enemies of the State (which is implemented through various processes including the institution of compulsory military service) has been a very prevalent mechanism of social cohesion. Other (less polemical) aspects of national consciousness have been muted for various reasons. For example, the existence of a common cultural space (including religious culture) and language are seen as too closely connected to the Ottoman legacy (even though there are clearly efforts to revive these dimensions by the governing political party). Academic analysis aside, the pressure on religious minority communities in Turkey is immense. I have witnessed firsthand how the Patriarchate of Constantinople is called upon almost daily to manage very difficult, complex and constantly evolving situations. And because most of hierarchs have very limited experience beyond the pastoral and theological fields, they can become too easily captive to the recommendations/counsel of external consultants, lawyers, human rights groups, and the multitude of visiting local and foreign officials.